Welcome to the Beijing Ming Tombs short introduction by China Report , a photographic virtual tour giving you a good first impression of the Ming Dynasty Tombs outside Beijing City, one map of the area and one map of the burial sites, some first backgrounds and information on the history of the Ming Dynasty Tombs and a link-page to other web-sites containing information on the subject. 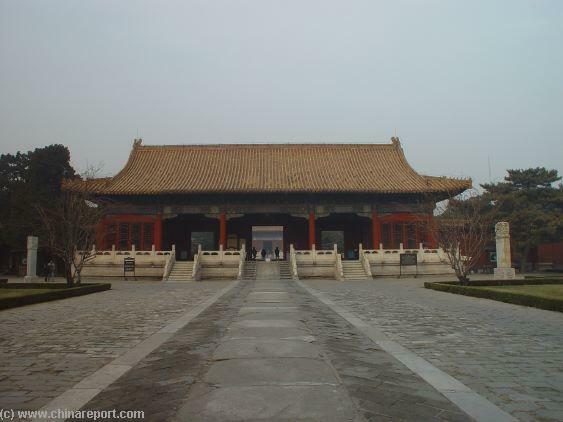 The exterior Gate leading into Chang Ling Mausoleum site, the Tomb complex honoring Zhu Di Emperor Yongle, 3rd Emperor of the Ming Dynasty. Changping Village and the road to the Ming Tombs. 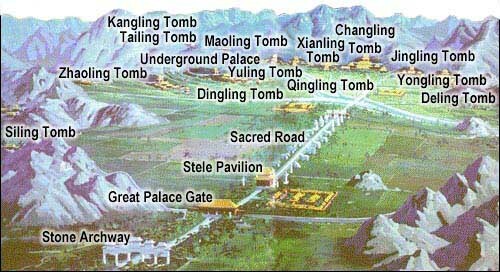 The other Tombs, Tai Ling, Kang Ling, Mao Ling, Yu Ling, Qing Ling, Xian Ling, Jing Ling, Yong Ling, De' Ling and Si Ling are not included, but some have been visited by Us. Update coming soon ! 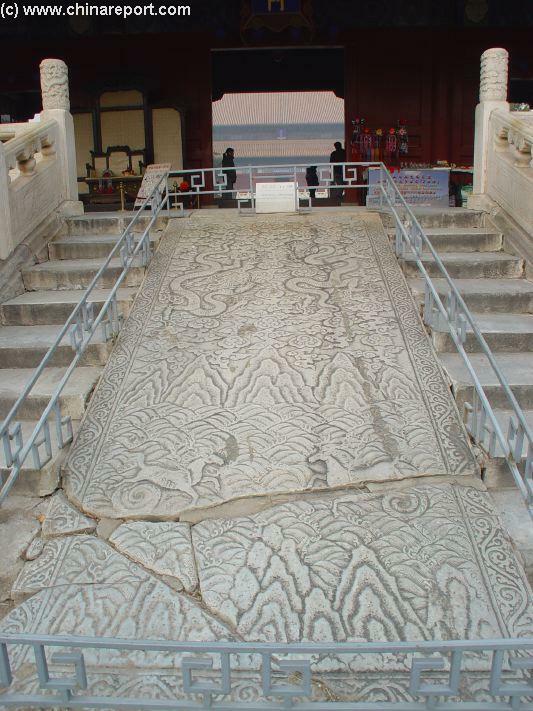 The Huge white marble slab decorating the Center of the Gate of Eminent Favours. 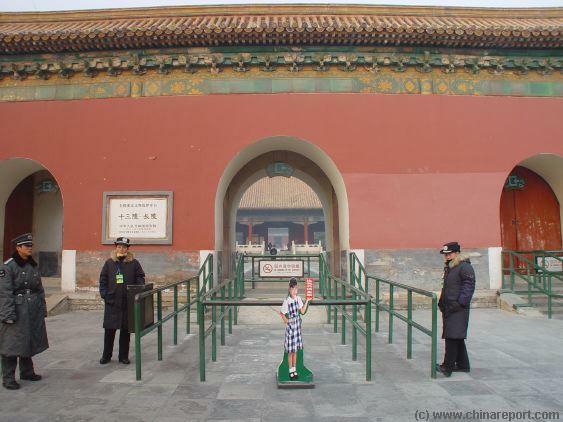 This central pathway was reserved for the spirits and dead Emperor alone, and the coffin would pass in air over the Center during burial ceremonies. 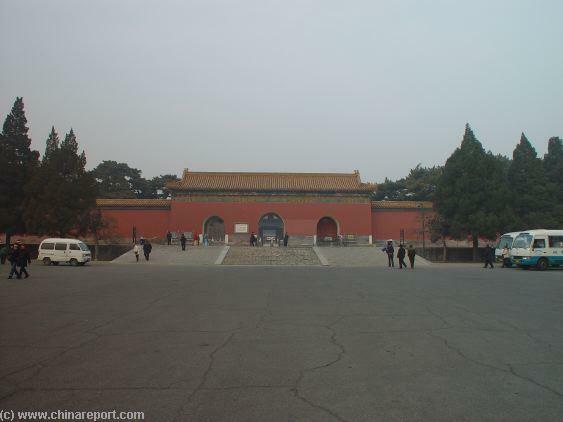 The Gate of Eminent Favor at Chang Ling, behind which lie the Central Hall (of Eminent Favors) with an exhibition on Zhu Di Emperor Yongle, founder of the Ming Tombs Valley, The Imperial Palace and more of the Imperial Capital of Beijing. 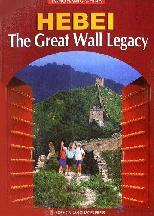 Eastern Tower inside the Gate of Chang Ling. Bell and Drum Tower stand adjacent the Main Entrance. 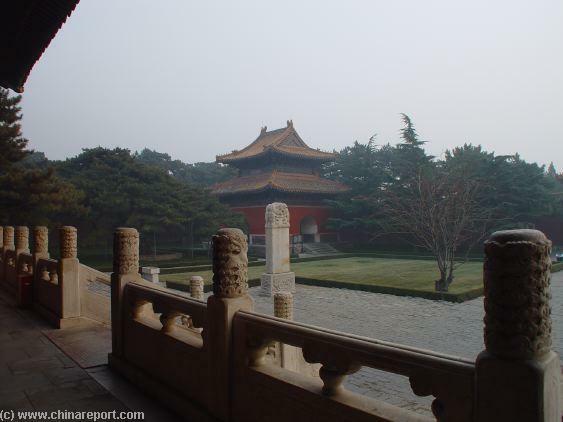 Overview of greenery and Drum Tower from the Gate of Eminent Favour. 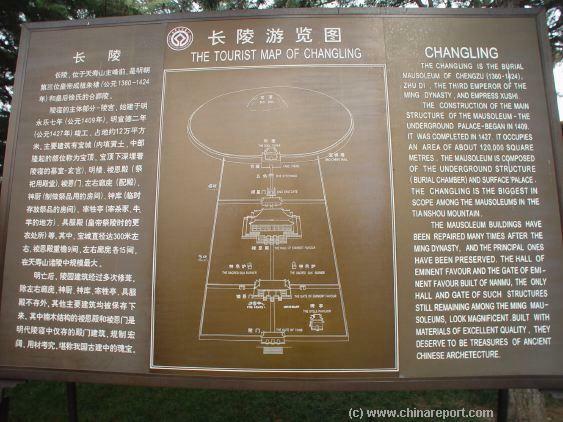 Show your Ticket at the Main Ceremonial Gate giving access to Chang Ling Mausoleum, the oldest Tomb in the Ming Tombs Valley. 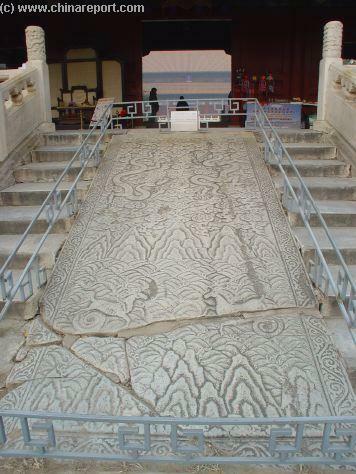 The Beijing Ming Tombs were severely damaged in the early years of the Ching Dynasty (1644 AD - 1911 AD). 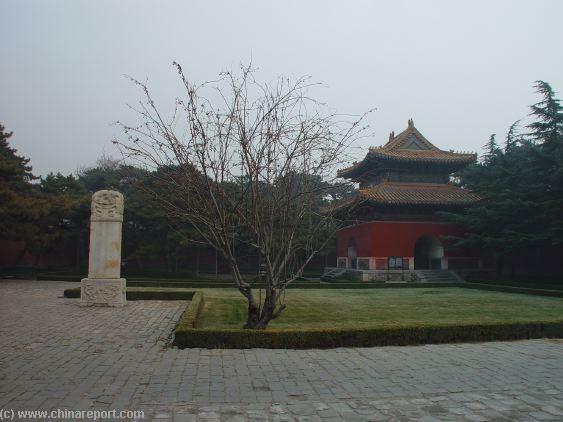 During the 18Th Century however, they were restored on the orders of the Qianlong Emperor ( 1736 AD - 1795 AD) out of respect for the Imperial History and the Heavenly Powers that ruled the Imperial Mandate.